Criss Cross Pipe Tobacco is a domestic blend of perfect combinations of Burley and Virginia tobaccos, air cured and ribbon cut. Each pouch you receive at out online pipe tobacco shop of Criss Cross premium tobacco is expertly produced with a smooth, mild, distinctive fulfilling taste and flavor. This high quality tobacco has the ability to satisfy any novice or the most experienced smoker, due to its ability to bring out a rather mellow smoke with a consistent burn. However you like to enjoy your tobacco, especially smoked straight in a pipe. Criss Cross Pipe Tobacco will deliver a satisfying smoking experience each and every time. 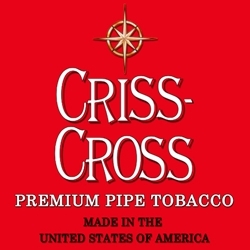 Criss Cross Pipe Tobacco is produced and distributed nationwide by SX Brands in the USA. Criss Cross Pipe Tobacco is available at our online tobacco store in unique styles to choose from. Mint, Original, and Smooth flavors. Every day smokers are trading in their expensive retail brands as a great way to save money in an over-priced world. Here at Smokers Discounts we believe you should too! We’ve made it easy and affordable to buy Criss Cross Pipe Tobacco online. Call us for more details!